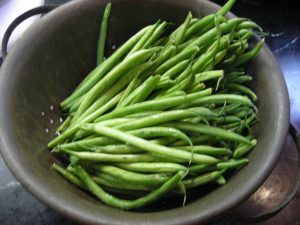 Cut off the stalk end first, and then turn to the point and strip off the strings ; if not quite fresh, have a bowl of spring water, with a little salt dissolved in it, standing before you, as the beans are cleansed and trimmed, throw them in ; when all are done, put them on the fire in boiling water with some salt in it ; when they have boiled fifteen or twenty minutes, take one out and taste it ; as soon as they are tender, take them up, and throw them into a colander to drain. To send up the beans whole, when they are young, is much the best method, and their delicate flavor and colour is much better preserved. When a little more grown, they must be cut across, in two, after stringing ; and for common tables, they are split, and divided across ; but those who are nice, do not use them at such a growth as to require splitting. I am unclear why she specifically calls for spring water to refresh her “not quite fresh beans.” But certainly she expects beans to have strings whatever their maturity. 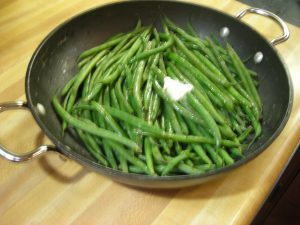 Today with the exception of heirloom or Italian or Romano-type beans most green beans have had the string bred out of them. I can’t resist including the etymology of the word ‘nice’ as it has evolved from MR’s time to ours. It has been quite a journey and if you have the patience to read it all you will come to a final conclusion with which I fully agree! Etymology: < Anglo-Norman nice, nis, nise and Old French nice (c1160; c1250 as niche; now French regional) < classical Latin nescius. Compare Old Occitan nesci (c1150; also attested as neci, nesi, nessi; Occitan neci), Spanish necio (1220–50), Catalan neci, nici (both 14th cent. ), Portuguese necio (14th cent. ; 15th cent. as néscio), Italian nescio (1321), all in sense ‘foolish, simple, ignorant’. The semantic development of this word from ‘foolish, silly’ to ‘pleasing’ is unparalleled in Latin or in the Romance languages. The precise sense development in English is unclear. N.E.D. (1906) s.v. notes that ‘in many examples from the 16th and 17th cent. it is difficult to say in what particular sense the writer intended it to be taken’. 3b. Fastidious, fussy, difficult to please, esp. with regard to food or cleanliness; of refined or dainty tastes. c1400 (1380) Cleanness (Nero) 824 Þis vnfavere [read vnsavere] hyne Lovez no salt in her sauce, ȝet hit no skyl were Þat oþer burne be boute, þaȝ boþe be nyse. a1425 St. Anthony 15 in Anglia (1881) 4 116 He wold neuer desyre oþer dayntys þan hys moder sett befor hym, os oþer nyse chylder done. c1530 A. Barclay Egloges ii. sig. Ki, Make hunger thy sawse, be thou neuer so nyse For there shalt thou fynde none other sawse ne spyce. 1551 R. Robinson tr. T. More Vtopia sig. Iiii, Anothere ys of so nyce and soo delycate a mynde that he settethe nothynge by yt. 1570 T. Tusser Hundreth Good Pointes Husbandry (new ed.) f. 40, The slouen and the carelesse man, the roynish nothing nice. 1600 T. Dekker Old Fortunatus sig. A2v, Your nice soules, cloyd with dilicious sounds, Will loath her lowly notes. a1656 Bp. J. Hall Shaking of Olive-tree (1660) ii. 3 Nice ears are all for variety of Doctrines, as palates of meats. 1702 W. Penn More Fruits of Solitude §136. 50 ‘Tis a Happiness to be delivered from a Curious Mind, as well as from a Dainty Palate. For it is not only a Troublesome but Slavish Thing to be Nice. 1707 E. Ward Wooden World Dissected (1708) 99 He is not so nice as his Superiors, whom nothing will go down with, under right Nantz or Rum. 1751 Johnson Rambler No. 104. ⁋9 The mind‥becomes‥nice and fastidious, and like a vitiated palate. 1789 Shepherd’s Wedding 10 Nae doubt ye wad be owr nice for to spin. 1808 Specimens Yorks. Dial. 18 She’s seea nice, She weant heeat puddin’ meead o’ rice. 1836 C. Shaw Let. 15 June in Personal Mem. & Corr. (1837) II. 593, I can eat anything, and am not very nice about the cleanliness. 1856 N. Hawthorne Eng. Note-bks. (1879) II. 318 Neither is it [sc. ivy] at all nice as to what it clutches, in its necessity for support. 1947 R. Pitter On Cats 15 To eat rats and such he was too nice. 1952 M. Kennedy Troy Chimneys 60 Nobody, seeing her then, could have been so nice as to complain of such blemishes. 1. pleasing; agreeable; delightful: a nice visit. 2. amiably pleasant; kind: They are always nice to strangers. 3. characterized by, showing, or requiring great accuracy, precision, skill, tact, care, or delicacy: nice workmanship; a nice shot; a nice handling of a crisis. 4. showing or indicating very small differences; minutely accurate, as instruments: a jobthat requires nice measurements. 5. minute, fine, or subtle: a nice distinction. 6. having or showing delicate, accurate perception: a nice sense of color. 7. refined in manners, language, etc. : Nice people wouldn’t do such things. 8. virtuous; respectable; decorous: a nice girl. 9. suitable or proper: That was not a nice remark. 10. carefully neat in dress, habits, etc. 11. (especially of food) dainty or delicate. 12. having fastidious, finicky, or fussy tastes: They’re much too nice in their dining habits to enjoy an outdoor barbecue. 13. Obsolete . coy, shy, or reluctant. 14. Obsolete . unimportant; trivial. 16. make nice, to behave in a friendly, ingratiating, or conciliatory manner. 17. nice and, sufficiently: It’s nice and warm in here. The semantic history of NICE is quite varied, as the etymology and the obsolete senses attest, and any attempt to insist on only one of its present senses as correct will not be in keeping with the facts of actual usage. If any criticism is valid, it might be that the word is used too often and has become a cliché lacking the qualities of precision and intensity that are embodied in many of its synonyms.